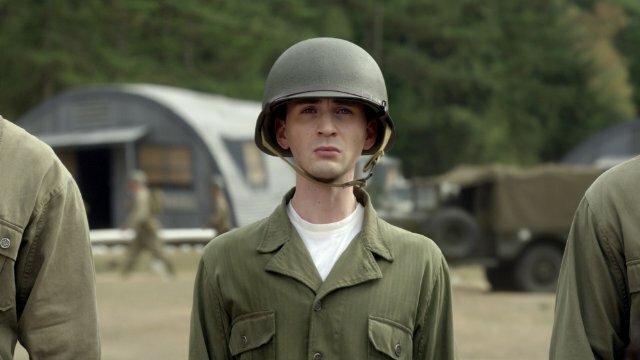 After multiple unsuccessful attempts to join the military, scrawny Steve Rogers is recruited to train as a super soldier. 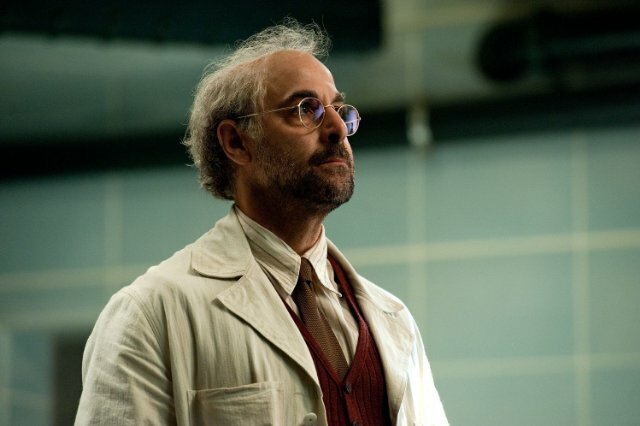 Despite the military’s continued disapproval, the top scientist on the project finds the true hero within Steve, solidifying him as the choice for the experiment. Similar to the HULK or IRON MAN, CAPTAIN AMERICA is not a mutant (born with super abilities), but a modified human through science. 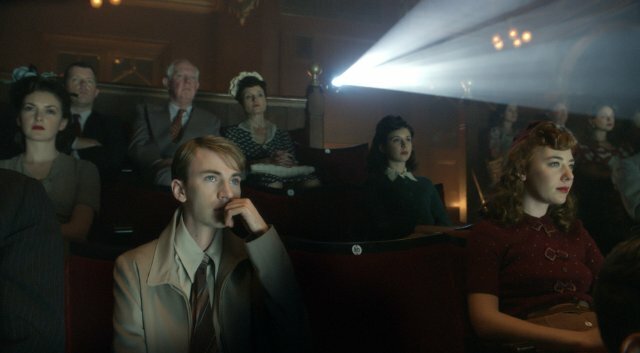 Thanks to the experiment, Steve Rogers’ strength, endurance, agility, speed, reflexes, durability and healing are all pushed to superhuman levels. 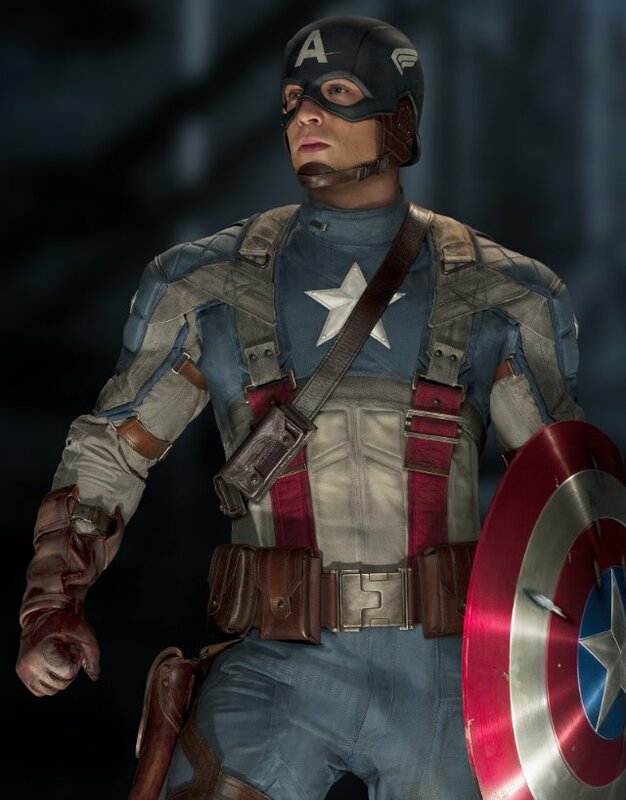 Made of a fictional metal, CAPTAIN AMERICA’s main weapon (apart from his fighting abilities) is his tried-and-true shield of red, white & blue. 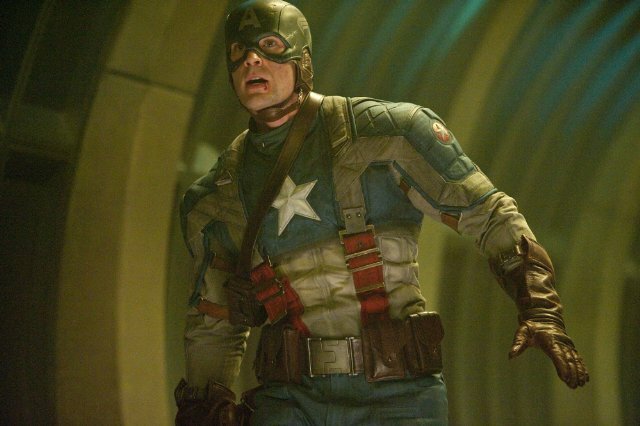 Playing the title role of CAPTAIN AMERICA is Chris Evans. Initially, I wasn’t sure how well he was going to do in the role. Evans you may recall, is no stranger to the comic-book-film crowd. He’s played Johnny Storm from FANTASTIC 4 twice now, not to mention a supporting role in SCOTT PILGRIM VS THE WORLD. Almost every movie he’s starred in, his characters tended to be cocky shallow types. CAPTAIN AMERICA is nothing like that. A character known to be the most trustworthy of superheroes, not to mention an honorable patriot, creates huge shoes for an actor to fill. Surprisingly enough, Mr. Evans did a great job. 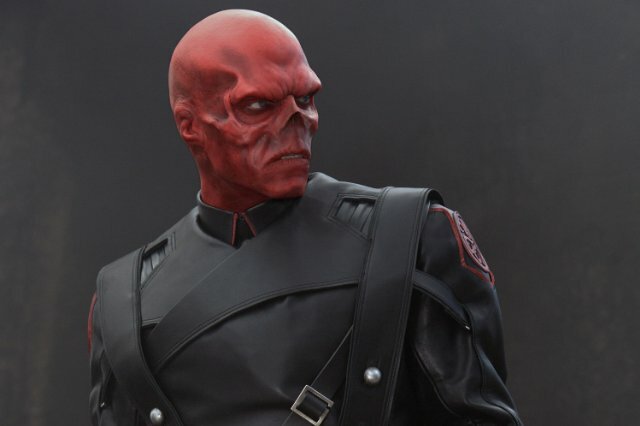 His nemesis, Johann Schmidt (a.k.a RED SKULL) is played by Hugo Weaving. 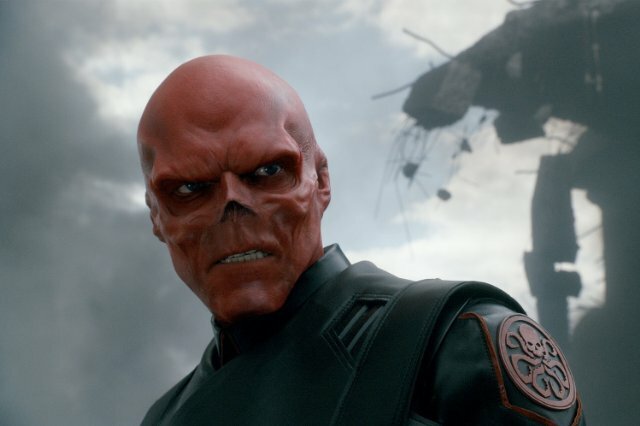 While Mr.Weaving’s acting chops have been already proven in many movies like THE MATRIX, V FOR VENDETTA and LORD OF THE RINGS (just to name a few), it was great to see RED SKULL wasn’t simply played as a caricature of the Nazi villain. 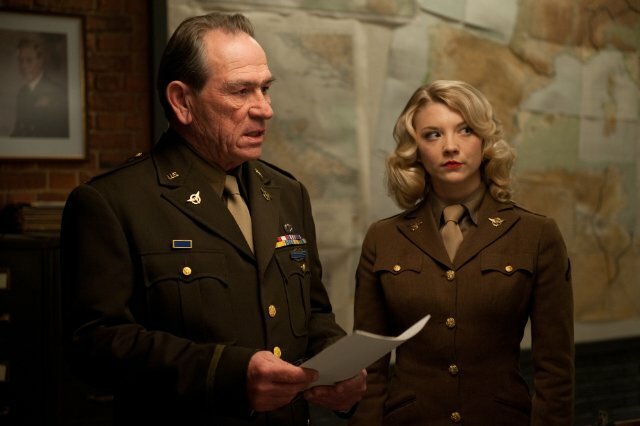 The rest of the cast includes Tommy Lee Jones, Dominic Cooper and Stanley Tucci. Haley Atwell, a British actress, plays Peggy Carter, the love interest of our hero. The one minor issue I had with the film has to do with the CG makeup effects. 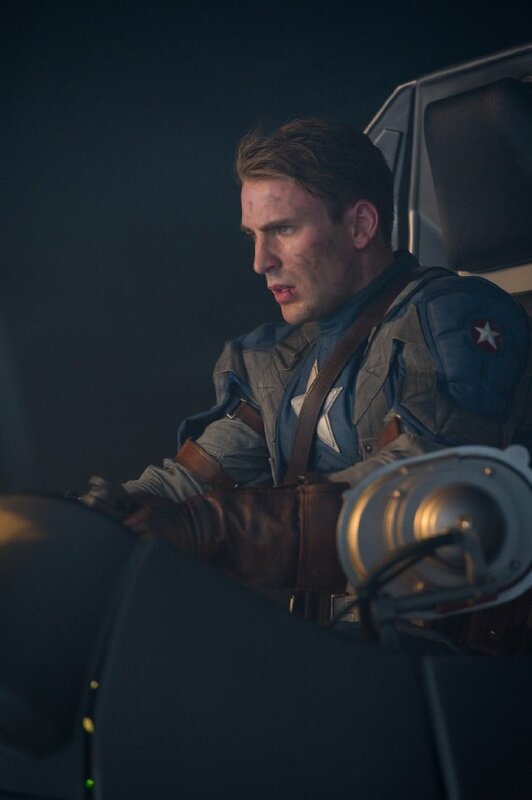 By that I mean, Chris Evans’ head on the pre-Captain weakling body. For the most part it looked very realistic, but there were some scenes (that could’ve just been due to the angle) that it looked more like a cut-out of his head. Otherwise, the FX are brilliant. Joe Johnston, with the always accomplished Alan Silvestri, manages to tell the wonderful story of a man with the heart of a true hero that is given the opportunity to have it match on the outside. 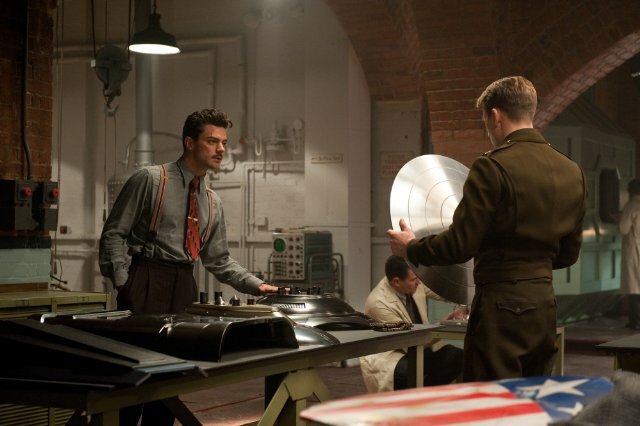 Unlike previous attempts to tell a CAPTAIN AMERICA cinematic story, the movie doesn’t get cheesy in any way. And while purists may or may not like the new uniform, the original design does make an entertaining appearance. Overall, I would highly recommend this movie. 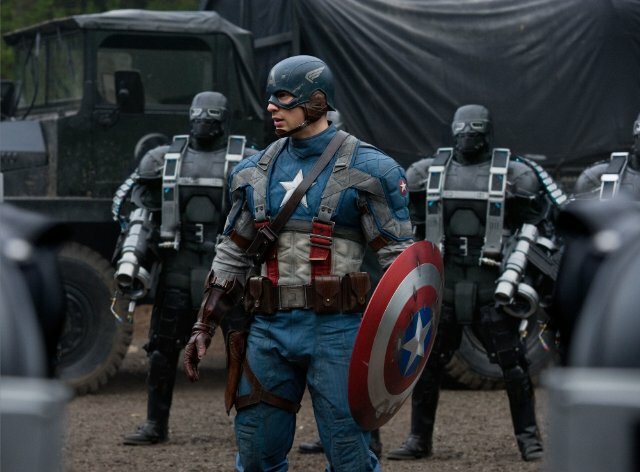 NOTE REGARDING SEEING THE MOVIE IN 3D: As with most of the 3D movies nowadays, the 3D is just okay in CAPTAIN AMERICA. Since the movie wasn’t filmed in 3D, it was done in post production. Despite that, there are many scenes where the depths of the environments are not too obvious but definitely observed. Luckily there were very few gimmicky 3D moments, however I wouldn’t say the movie HAS to be seen in 3D.